Antonio Valencia will depart from Manchester United after a memorable 10 seasons at Old Trafford. Ole Gunnar Solskjaer has confirmed that the Ecuadorian will no longer be a United player next summer. However, the Red Devils will be short of right fullbacks when the 33-year-old departs from the club. The club's captain was the indisputable first choice for Jose Mourinho last season. He started 31 times in the league and scored 3 goals. Valencia's current replacement Ashley Young has been heavily criticized recently and has also hit past 30years of age. Hence, United will most likely search for a right fullback as their top priority. 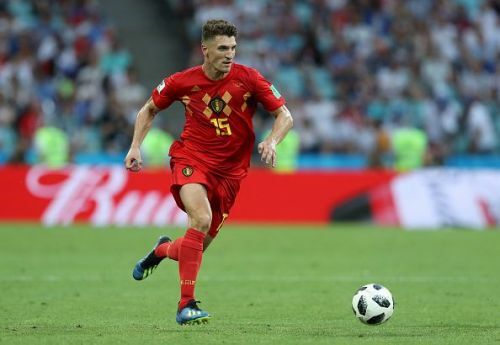 Thomas Meunier has also been considered as a potential candidate to fill this troubled position. Here we will take a look at why United should sign the PSG defender to replace their ageing captain. It is no secret that Manchester United has struggled throughout the season to find a dependable winger. Juan Mata, Alexis Sanchez, and Jese Lingard have all been unable to significantly contribute to United's productivity. On the other hand, fullbacks such as Antonio Valencia and Ashley Young also have not become of much help in scoring goals or creating assists. Hence, strikers such as Romelu Lukaku and Marcus Rashford are often lack supply from the wings due to this lingering problem. Meunier has been known for his outstanding offensive capabilities despite playing mostly as a right fullback. He has been involved in an impressive 14 goals from 38 appearances in all competitions. Hence, he could provide enough supplies for United strikers and further boost the team's overall offensive capability. He has also starred prominently as right wing back this season and would perfectly fit Solskjaer's 3 center backs scheme. Apart from his excellent productivity, Meunier is also defensively sound and would be enough to cover most of Antonio Valencia's defensive duties. Former Barcelona fullback Dani Alves has been a considerable hindrance for Meunier this season. Alves's reputation as one of the best and most consistent fullbacks has given Thomas Tuchel a hard time in deciding PSG's first choice player at the position. Meunier has started just 16 times from 30 of PSG's Ligue 1 games this season due to the fierce competition. The 27-year-old has yet to gain a foothold at the French outfit as he has never started more than 18 times a season for PSG in the league despite his promising display for club and country. He also seems to have failed to gain the trust of the PSG faithful after he was bullied by his fans for stating his interest in moving to United. His unfortunate situation would benefit United a lot over their chase for the Belgian. His price is estimated to be around €35 million and would be a cheaper alternative for United if compared to other targets such as Aaron Wan-Bissaka.